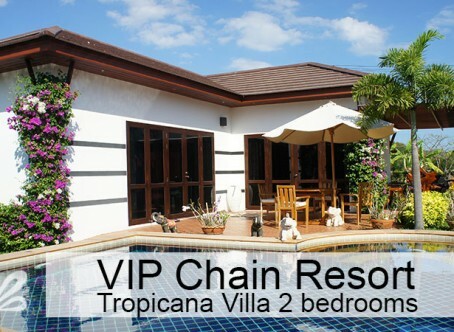 VIP Real Estatet Co Ltd (Easyrent.asia), has over many years build up two success full resorts at Mae Ramphung Beach Rd. The concept is based on new renovated homes or brand new homes. Those homes are we selling and servicing. To make it easy for our buyers do we have our hotel / resort concept. For our customer do we rent out their home when they dont use it and at the same time offer similar services as a hotel. It is very popular because you pay less than a hotel and get almost same service level. When you combine the two services do you have very low cost, low risk and very high flexibility. For rental guarantee do we offer either 7% for 2 years, 6% for 5 years or 5% for 10 years. In this case would it be most common and relevant to talk about 5 years rental guarantee. When you combine the price guarantee for selling do we this concept where you in average will pay about 830 thb per month for a big studio. In the second box in the right side can you see the numbers. Shortly explained do you invest in a condo or house. You get an equity loan in your own country. A loan cost today about 3-4 percent. With flexible interest can it be even cheaper. At the same time you invest in the home, do you sign a contract for rental guarantee and price guarantee. The reason you need the rental guarantee is if you for some reason need to change job, can you earn profit for rental and when pay back your loan. It will cover both loan cost and maintenance cost until you can sell the home. The selling guarantee can be used after 3 years and not later than 10 years. Even if you change job can you also keep the home as an investment. It will in average increase in value and at the same time will running cost be covered from rental.